Over the weekends I’ve been making my own freezer meals. I work until 6 and don’t get home until 7 or later each night which makes cooking a bit difficult. However, I’ve run into a dilemma because I’m really opposed to traditional freezer meals. The idea of a lean cuisine makes my stomach turn. So rather than giving in the the urge to eat things that have been processed far far away from me, I’ve been experimenting with my own version of freezer food. 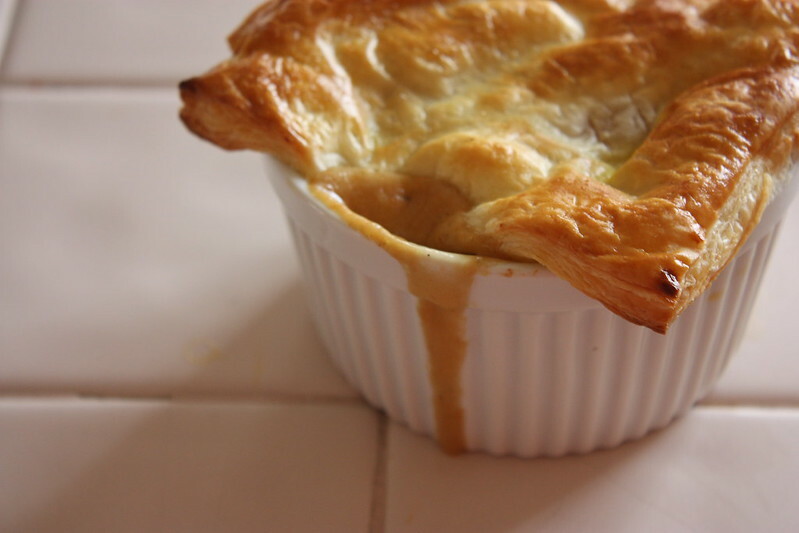 This week I made chicken pot pies in their own little ramekins complete with a puff pastry top. Martha Stewart helped me out with the recipe. She’s the best. slightly adapted from Martha Stewart Living. 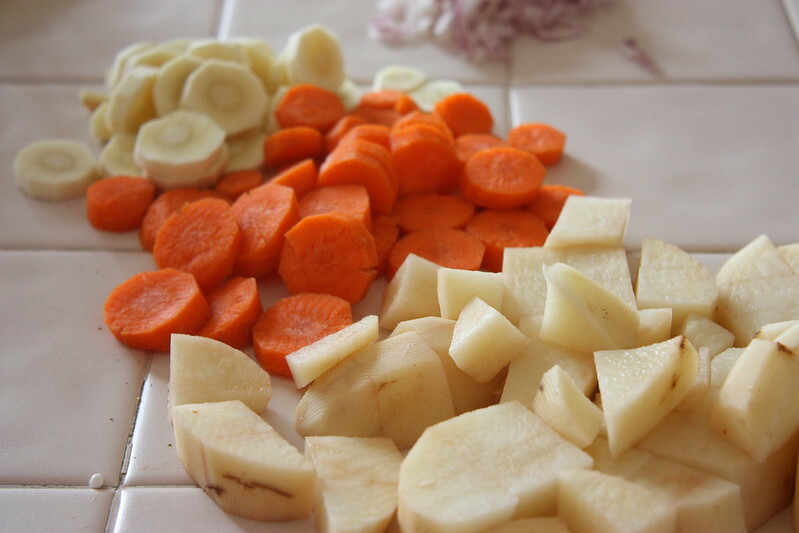 Add your parsnip, carrot, and potato. Cook until soft, about 8-10 minutes. Throw in your chicken and let it cook for 2-4 minutes. Add your cornstarch mixture and heavy cream. Stir well to combine and let simmer for 5 minutes or until thickened. Spoon the mixture evenly into 4 ramekins. Top each dish with a square of puff pastry. Gently brush each piece of puff pastry with your beaten egg. Cook in a 425 degree oven for 12-15 minutes. Enjoy! I cooked one and froze the other three. When I reheat them I’ll probably knock the heat down a bit and cook them a little longer. I think they’ll be awesome “freezer food” and are so much healthier than anything I’d find in a store. chicken pot pie crust is the cure to any bad day! It definitely is!! Especially when it’s puff pastry on top :)! These look so delicious! I love making meals ahead of time, makes my life SO much easier! I somehow didn’t get the “memo” that you had “moved” to this new place! SO glad I found you! So happy to have you in my new home :)!! I’m sorry I wasn’t great about getting the word out. I missed a bunch of my old followers :((. And yes, freezer meals are THE BEST! Great idea, this looks delish. Chicken pot pie is one of my ultimate comfort foods. I don’t do a lot of freezer cooking (small freezer) but usually will at least freeze homemade soups, pasta sauces, lasagna, etc. Have you made the lasagnas in muffin tins yet? 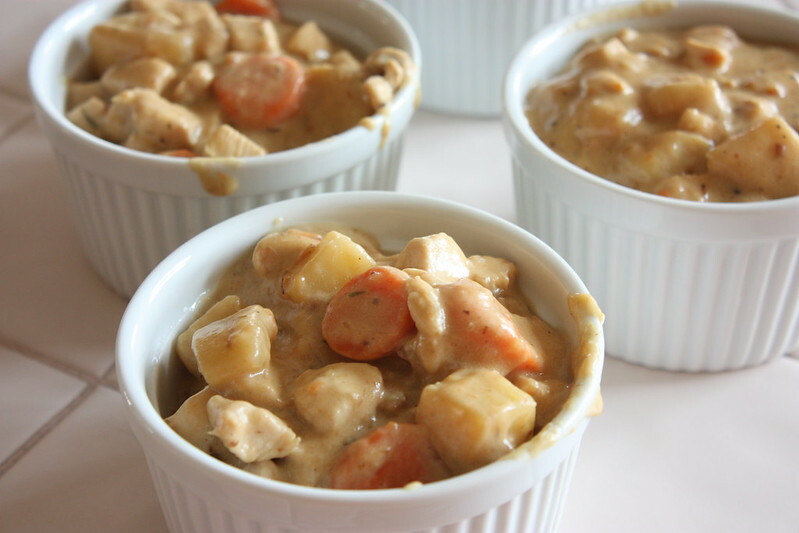 They’re one of my fave stash-away meals. I tried the lasagna in muffin tin thing but I’m pretty sure I cooked it wrong :(. The noodles came out tasting really papery… Do you have a good recipe? I’d love to give it another try!!! You might introduce a couple of sprigs of rosemary at boiling time if you like rosemary. It gives the dish an earthy note. Of course pull the sprigs out at completion. Don that sounds awesome!! I’ll have to do it next time. Sean has been loving these but I bet he’d be even more excited about it with the extra rosemary :).